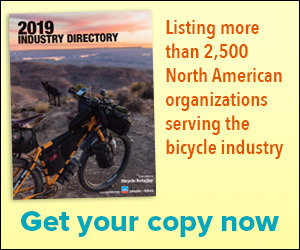 MISSOULA, MT (BRAIN)—Adventure Cycling Association, North America's largest cycling membership organization, has announced the receipt of four new grants totaling $100,000 to support its efforts to create what will be the world's largest official bicycle network: the U.S. Bicycle Route System (USBRS). BOULDER, CO (BRAIN)—Product Architects, Inc., maker of the Polar Bottle, has partnered with the Team Tony Foundation to raise money to support the foundation's mission of helping cancer survivors. NEWBURY PARK, CA (BRAIN)—October is Breast Cancer Awareness Month and for the entire month Giant Bicycle and the Young Survival Coalition are sponsoring a bicycle design contest open to those who have been diagnosed with breast cancer. GREENVILLE, SC (BRAIN)—A bicycle master plan calling for more than 170 miles of new bike routes and upgrades in Greenville, South Carolina, was approved by city leaders Monday. BOULDER, CO (BRAIN)—It’s the first Saturday of October this weekend, and that can mean just one thing: Thousands of young cyclists will be hitting the trails for IMBA’s annual Take a Kid Mountain Biking Day. WATERLOO, WI (BRAIN)—In an effort to create a greater, and more connected, network of cycling advocates in the United States, Trek Bicycle has partnered with People for Bikes to increase and reach and potential impact of those who will rally support for local and federal spending on bicycle infrastructure. LAS VEGAS, NV (BRAIN)--The International Mountain Biking Association drew its usual standing-room-only crowd for its yearly update on dirt projects, advocacy work and future initiatives. DENVER, CO (BRAIN)—There may not be much bipartisan cooperation in Washington these days, but when the National Conference of State Legislators meet in San Antonio tomorrow, politicians will put their differences aside for a 12-mile tour of San Antonio, Texas, and they'll do it in custom Primal Wear jerseys. WASHINGTON, D.C. (BRAIN)—In line with a goal to double federal funding for biking and walking, Advocacy Advance is awarding $100,000 in direct grants to four advocacy organizations. CINCINNATI, OH (BRAIN)—Outdoor Industries Women’s Coalition (OIWC) has a rejuvenated mission and vision and is also launching a new advocacy program. LAS VEGAS, NV (BRAIN)—Signaling that both the cyclocross season and Interbike are approaching, registration for CrossVegas opens on August 2. The biggest cyclocross race in America takes place for a fifth year on Wednesday, September 14 following the first day of Interbike. SAN FRANCISCO, CA (BRAIN)—Mike’s Bikes has teamed up with PODS of San Francisco to collect bicycles for its Sister Shops project in Africa. In just two weeks, PODS helped the Bay Area retailer gather 500 donated bicycles in record time at eight northern California store locations.